Have a question? Have an idea to share? We want to know! We'll get back to you at the email address you provide. Adventure Kitchen will be in touch soon. Adventures in food for curious cooks. Why Did the Chicken Cross the Globe? Traditional Mexican dessert served on Three Kings Day, also known as Epiphany, on January 6. Traditionally served with frothy Mexican Hot Chocolate. Traditionally, the person who finds the Baby Jesus in their slice will host the next party on Candelaria (Candlemas), on February 2. To learn more about Three Kings Day and the role this sweet bread plays in the celebrations, you can read our blog post about it. This recipe is based on the one found at Mexico In My Kitchen, the website of Mely Martinez. Mely's website is a great resource for authentic, homestyle Mexican food recipes from all over Mexico. Serves at least 16-20, depending on the size of the slices. Finished Rosca de Reyes, made in the Adventure Kitchen in January 2015 (shown with a molinillo used to mix Mexican Hot Chocolate). 3/4 cup (1 1/2 sticks) unsalted butter, softened; plus a bit more for buttering the bowl and smearing on the dough as it rises. 1. Combine the yeast from the packet with 1/2 cup warm water in a glass measuring cup or small bowl (water should be between 80-100 degrees Fahrenheit, which is roughly your body temperature. If you don't have a cooking thermometer, you can test a drop on the inside of your wrist: it should feel neither hot nor cool as it hits your skin.) Stir to thoroughly combine, then let stand, undisturbed, for 5-10 minutes. Yeast-flour mixture after it has doubled in size. 3. If you have a stand mixer, use it for this step with the paddle attachment. If not, you can use an electric mixer with a large mixing bowl. Combine the eggs, egg yolks, milk, salt, orange extract and orange zest mix to combine. Add the softened butter and briefly mix to thoroughly combine. Add the remaining 3 1/2 cups flour and beat until well combined. 4. After the yeast-flour mixture has doubled in size, add it to the large bowl and beat to combine. If using a stand mixer: switch to the dough hook attachment and knead for 7 minutes on a low speed (we use #1-#2 setting). If you don't have a stand mixer: dump the dough onto a lightly floured work surface and knead by hand for 15-25 minutes, until you have a smooth dough. It will be very sticky and soft, sort of wet but manageable. Try to get by with a minimum amount of added flour. If you add too much flour the bread will turn out dry. 6. When you are finished kneading, smear a little softened butter over the surface of the dough and place it in a large buttered glass or stainless steel bowl. Cover the bowl with plastic wrap and set it in a warm spot, ideally between 80-100 degrees Fahrenheit. Allow the dough to rise until it doubles in volume, about 1 - 1 1/2 hours or more. Again, if your kitchen is cool, it may take much longer to achieve this. If you are baking on a cold winter day, you may need to rest the bowl near a sunny window, on or near a heater, or on top of the oven turned on to lowest heat. 7. After the dough has doubled in volume, remove it from the bowl and knead it a few times by hand on a lightly floured surface. Form the dough into a round ball, and poke a hole in the middle of the ball. Use your hands to gently stretch the dough away from the center so that it forms a large ring. Make the hole larger than you want it to be when finished; as it rises, the hole will shrink. Transfer the ring to a large baking sheet that has been greased or is lined with parchment. (We prefer a wide, unrimmed sheet for this. We have learned the hard way that it can rise so much as it bakes that it may overlap the rims!) Cover the dough loosely with buttered plastic wrap and set the baking sheet in a warm spot to rise again, for 45 minutes or so. Again, it should roughly double in volume. 8. During this final rise, prepare the sugar paste topping. Cream the softened butter and powdered sugar together, then add the egg yolk and mix to combine. Add the flour and mix thoroughly until it forms a uniform paste. 9. Whisk the whole egg together with the milk or cream to make an egg wash.
10. Open the cold oven and move the rack to the lower third of the oven. Preheat the oven to 375 degrees. If you are inserting the baby doll(s) into the dough before baking (assuming they are oven safe), you may do it as soon as the bread has finished its rise. Insert them vertically from the bottom, so that they will be standing up inside the bread. 11. With the dough still on the baking sheet, brush it all over with the egg wash. Use your hands to form the sugar paste into rough cylinders and use your fingers to press and spread the cylinders into strips onto the bread as shown. It works best if these strips narrow as they meet in the middle; otherwise you may end up with a gloppy uncooked mass of sugar paste in the center after baking. 13. 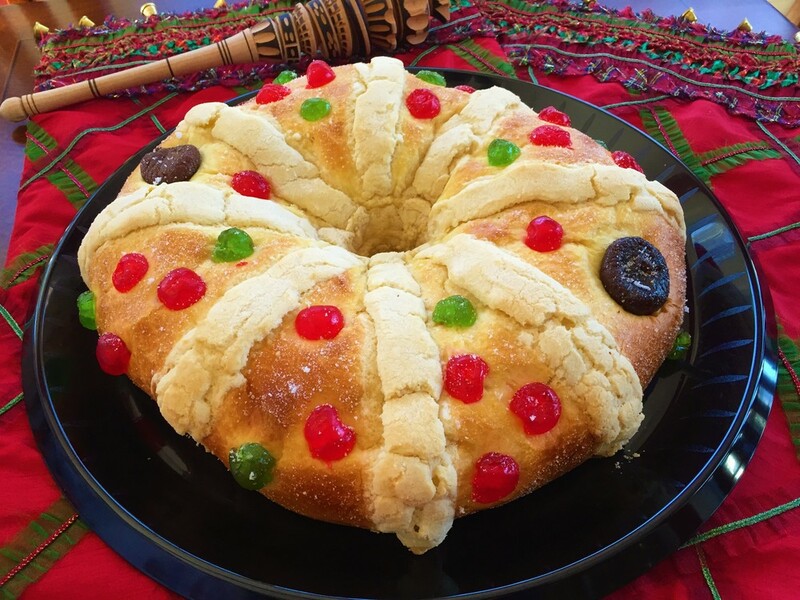 Bake for 10 minutes at 375 degrees, then turn the oven down to 350 degrees and bake for another 10 minutes, or until your Rosca de Reyes is golden brown. 14. Cool on a wire rack. If you did not insert the baby doll(s) into the dough before baking, you can do it now. Again, inserting vertically from the bottom works best, so they are standing up inside the bread. Finished Rosca de Reyes made in the Adventure Kitchen, January 2015 (shown with a molinillo for mixing Mexican Hot Chocolate). Adorned with dried figs and red and green candied cherries. 15. Your Rosca de Reyes is ready! Serve with lots of frothy Mexican Hot Chocolate. Be sure to let your guests know that there is may be an inedible surprise inside - and they may be hosting the next party! Get recipes and other tales of adventure, delivered fresh to your inbox each week. Recipes and other tales of adventure delivered fresh to your inbox each week. Hey, you know what's cool about Adventure Kitchen? No ads! (Awesome, right?) Please note that links to Amazon are affiliate links. Thanks! Adventure Kitchen is a registered trademark. All rights reserved.